A while back, we took a look at The I Love Trader Joe's College Cookbook. 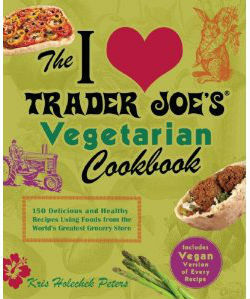 And this year, we were able to take a look at another book in the same series from Ulysses Press, The I Love Trader Joes Vegetarian Cookbook By Holechek, Kris. Although Sonia and I have often flirted with the idea of going vegetarian, we've never fully committed to the conversion. But we still do an occasional "Meatless Monday" and often enjoy vegetarian dishes, especially from Trader Joe's. As most of you know, TJ's has a pretty good selection of vegetarian items, some of which are very unique and difficult to find elsewhere. This cookbook not only takes full advantage of the wide spectrum of vegetarian options from Trader Joe's and Ms. Peters' extensive knowledge of them, but it offers 150 ways of combining them that I wouldn't have thought of in a million years—and each recipe, if not already vegan, has a fully-vegan alternate version included. This cookbook gets creative. One of the recipes takes Trader Joe's Potato Tots and turns them into Texas-style vegan nachos—er, excuse me, "Totchos." Even with limited time and money, there are plenty of simple recipes in here. 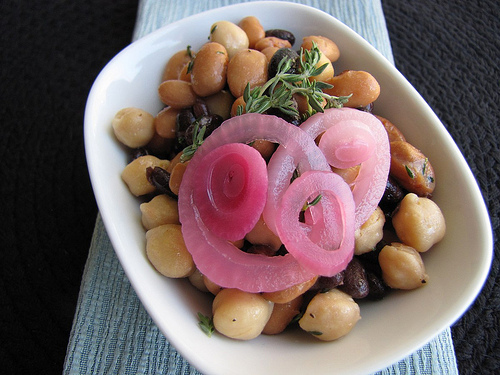 The three bean salad, pictured right, is delicious! (Though, I must admit, we didn't pickle our onions). But had we chosen to pickle them, there's a recipe for that in the book, too! Featuring casseroles, beverages, soups, desserts, and more, The I Love Trader Joe's Vegetarian Cookbook flaunts dishes for every occasion—dishes tasty enough not just for vegans and vegetarians, but for your average, everyday omnivores as well. To learn about the author, to see more mouthwatering pics of her fantastic vegetarian fare, or for some sneak-peek recipes from the book, check out her blog, Nom! Nom! Nom! To order the book from amazon.com, just click here! It's the perfect gift for all of the vegetarians, vegans, and fans of Trader Joe's in your life.